Got an SX 75CNA bass which looked like it would be a good platform for a jazz bass. It's a clear finish with bound maple board and block markers. Got a set of Lindy Fralin vintage pickups, a set of CTS pots, Orange Drop cap, some copper shielding sheet, Dunlop flushmount straplocks, TI JazzFlat strings. I did a level check on the frets, and they were bang on, with the ends being rounded off nicely. I think this is because it has the binding, they take a lot more care. Next I took the shine off the back of the neck with some 400 grit sandpaper, this makes the neck a lot faster. This weekend I'll get started on the shielding and component installation. The SX pups actually sound quite decent, but adding the Fralins should provide more fat and punch in the bottom end, and a bit more sweetness in the tops. I'm currently doing intensive rehearsals for a three week season of Canterbury Arms - Music Hall with the Napier Operatic Society, and I used the bass in stock form at last night's dress rehearsal. Sounded pretty damn good in stock form, so I'm looking forward to the hotrodded version! Last edited by martyforrer on Fri Nov 12, 2010 1:41 pm, edited 1 time in total. How about some photos, Marty? For cheap gear, there's some OK instruments coming from SX these days. I'll try get some pics up as I do the job. Well I'm surprised. I did the deed this morning, Shielded all the cavities and provided a complete earth circuit, installed all the goodies plus an Allparts bridge. Forgot to take any pics! Initial observations: The CTS pots are very smooth, the Orange Drop capacitor gives a WAY better roll-off of the highs, and the whole system seems very quiet. The big surprise came from the Fralin pickups. What I expected was a sweet top and increased bottom. What I got was a sweet top and the same bottom I had before, but a very smooth, refined sound. If the SX pups were a Honda, the Fralins are a Bentley. The mids are more refined, more useable, and I'm looking forward to trying it out at tonight's show. The only downside, apart from the $250 , is they have less output, so will require a little more on the gain knob, not that that's really a drawback. I did a thorough shield job on my SX Jazz, but did not change the pups. Adrian dressed the frets to make the neck reasonable. 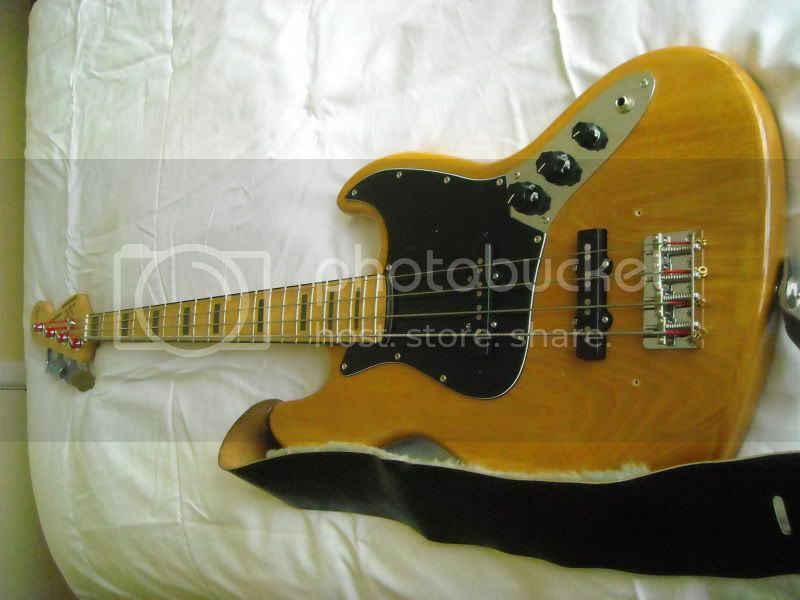 For a cheap beater bass, it sounds OK and is a back-up at a gig if I feel I need one. I don't think I'd ever buy another SX though, even though the thought of a P Bass flits through the mind box now and again. All done. Did a show last night, and it's a keeper. Very smooth sounding, no good for a balls-out rocker, but perfect for an old fart like me... Nice articulate sound, plenty of punch, and really nice to play. This model is quite different from standard 57 or 62 series SX's, in that the frets are finished to a much greater degree, probably because of the binding on the neck. There was nothing I could do to the frets on this to improve them. The fact that I work for the SX importer means I could pick and choose from many instruments to find the best. I see the whole pic, I think the pic in half thing is because of your screen resolution? Very cool marty,love the look of the neck,its looks mint,glad its a keeper,and the satisfaction of doing it yourself. Where are the chrome covers ? I see the holes,and dont tell me they were yours on tardme cause I missed the auction closing and wanted to scoop em up....poos. ? Sorry Chris, yes they were mine. Gone to Wanganui. Ha that sums up the luck I have on tardme,I miss the stuff I want and can afford,and end up with stuff I want but cant afford !